Each real estate transaction in Tennessee contributes a fraction of one percent of the transfer tax to a fund that is the major funding mechanism for land and water conservation projects each year, average annual total $15 million. As state budgets have been strained periodically, these monies are sometimes redirected to the General State Operating Account. The TN Parks and Greenways Foundation has spearheaded for the last two years the Forever Green campaign to have those monies redirected to their stated intention. Conserves wildlife and water and places to hunt and fish. Saves our scenic treasures in state parks and forests. Builds great local parks and greenways. Leverages 50% match from local governments. Helps farmers and protects our drinking water by providing cost-share programs to reduce pollution in our streams. 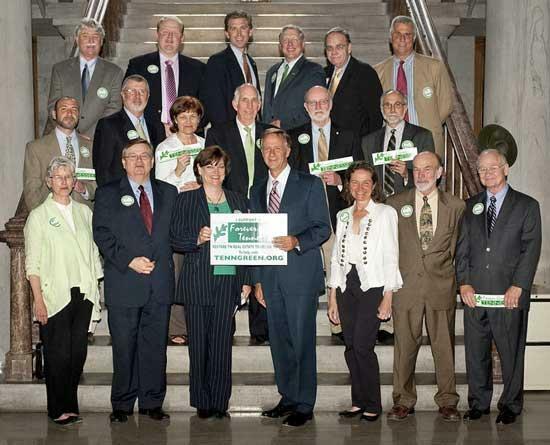 One Wednesday, May 11, 2011, Governor Bill Haslam met with members of the Forever Green Tennessee coalition to endorse the campaign and further show his support for the Tennessee Real Estate Transfer Funds (which he has already done twice by including the RETF in both of his FY 2011-12 proposed budgets). Nice to see Neal Applebaum from Cannon County representin'! He really does alot of good things for this county!